The ULC ordination is legal in South Carolina, as two attorney general opinions from the 1970's proves. Laws that govern who are able to perform legally-recognized marriages are highly subjective and difficult to interpret; even government officials within the same county clerk’s office can have many interpretations of the implications of a single law. In situations where laws are hard to interpret, like those involving the validity of the Universal Life Church’s ordination, legal precedent is important. Legal precedent is a decision or opinion on a legal matter that has been made before. This can be in the form of court cases or societal customs. In the State of South Carolina, ordained Universal Life Church ministers have a legal precedent that allows them to act as a wedding officiant. This precedent was set forth in two letters written by the Attorney General and Assistant Attorney General of South Carolina in 1971 and 1973, respectively. In these letters, it is made clear that in the opinion of both men, ULC ministers are able to perform legally binding marriages in that state and that the Universal Life Church is a government-recognized church. Daniel R. McLeod, who was South Carolina’s Attorney General in 1971, wrote that until the Universal Life Church is proven to not be a bona fide, or legitimate, religious organization, their ordained ministers enjoy the same rights as any other recognized religious authority. McLeod wrote that he is of the opinion that religious institutions should be “taken at face value,” and it is not in good practice to unnecessarily pry into a religious organization to check if it is bona fide. In other words, a religious organization is legitimate until proven illegitimate. The Universal Life Church therefore has legal protections under the law in South Carolina. However, the ULC would lose these protections if it were found guilty of fraud. McLeod closes the letter by saying that in his opinion, it is better to let “a charlatan be permitted to operate” than to start disrupting religious freedom by analyzing the genuineness of all religious institutions. The South Carolina Assistant Attorney General in 1973, James C. Harrison, Jr., agreed with McLeod by writing that ministers of churches like the ULC are allowed to act as wedding officiants. 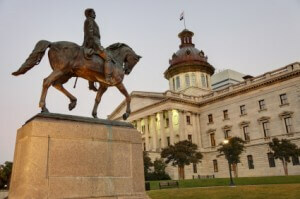 Harrison presented a section of South Carolina’s Code of Laws, Section 20-2, which states that only “ministers of the Gospel or accepted Jewish Rabbis and officers” can perform binding marriage ceremonies. Harrison then opined that any person recognized by their faith to be a wedding officiant is a minister of the Gospel. So long as the Universal Life Church is a bona fide organization and its ministers are authorized by the church, they can conduct valid marriage ceremonies. Because McLeod stated that he believes the ULC to be legitimate until proven otherwise, this means ordained United Life Church ministers meet both of Harrison’s requirements. From these letters, it is clear that South Carolina officials authorize ministers ordained by the ULC to perform valid wedding ceremonies. McLeod and Harrison point to religious freedom, privacy, and the presumption of no wrongdoing as the basis for their opinions. These concepts are integral to the U.S. legal system. If South Carolinian Universal Life Church ministers ever encounter difficulties with government officials about the validity of their ordinations, these two attorney general opinions would be integral in convincing the officials of their mistake.